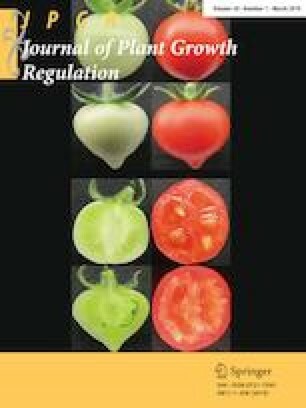 The contributions of strigolactones (SLs), cytokinins (CKs), and indole-3-acetic acid (IAA) to the regulation of correlative inhibition (CI) in two-branched 10-day-old (2-B) pea seedlings were studied in different cultivars in comparison with single-shoot seedlings (1-B). The first group of cultivars (Adagumsky and Torsdag) was characterized by a tall phenotype, strong apical dominance, and CI between branches, with IAA export activity (IEA) being almost 1.5–2 times lower in the shoots of 2-B plants than in 1-B plants. Branching IAA-response (rms2-1) and SL response/deficient (rms4-1/rms1) mutants of Torsdag also displayed CI at the level of the shoot IEA. In Torsdag, vascular supply of 6-benzylaminopurine in the hypocotyl, which led to an increase in IEA, equalized IEA differences between the 2-B and 1-B shoots, thus overcoming CI. In 1-B plants of these cultivars, the levels of xylem-CK were three-fold higher than that of 2-B plants, suggesting a key role for xylem-CK in establishing CI. The previously proposed dynamic model, where IAA and CK interact in interlocking feedback loops, can account for the regulation of CI in these cultivars. By contrast, both the growth and IEA of shoots in the second group of cultivars (Térèse and Porta), which displayed a dwarf phenotype and weakened apical dominance, were similar between 2-B and 1-B plants. Porta had an increased shoot IEA, but low xylem-CK levels as compared to Adagumsky, with both cultivars showing a similar response to CK. Therefore, we assume that in the second cultivar group, the shoot IAA synthesis/export is probably independent from xylem-CK, and further studies are needed to find a factor responsible for loss of CI in these cultivars. The ​original ​version ​of ​this ​article ​was ​revised: ​The dot lines were missing and unnecessary circles were filled in Figure 5. We thank Dr. Catherine Rameau (INRA Centre de Versailles-Grignon, France) very much for providing the seeds of pea wild-type cultivars and the rms mutants, Prof. Dr. B. Zwanenburg (Radboud University Nijmegen, The Netherlands) for the kind gift of the synthetic strigolactone GR24.